Russian artists Igor Stravinsky and Vaslav Nijinsky were popular in their time: Stravinsky for music, Nijinsky for dance. When their radically new ballet, "The Rite of Spring, " was first performed in Paris on May 29, 1913, the reaction was so polarized there were fistfights and riots Brilliant or disastrous, the performance marked the birth of modern music and dance. 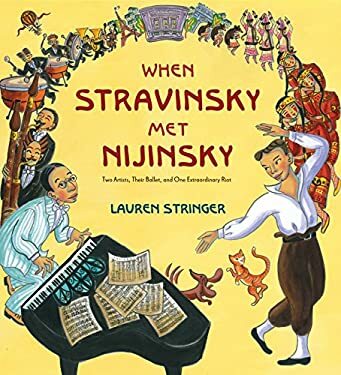 Stringer's rhythmic text and gloriously inventive, color-rich paintings capture the wild and imaginative collaboration of composer and choreographer. The fascinating author note includes photos of the dynamic duo and "The Rite of Spring" dancers.